Combining low ownership costs and superior strength with exceptional serviceability, comfort and safety, the JCB 3CX is the ultimate entry-level machine from the world’s number one backhoe loader manufacturer. Productivity, performance and efficiency are all class-leading; add a versatility-enhancing options list and comprehensive warranty packages, and the 3CX really is the best value backhoe for large fleets, rental yards and smaller businesses alike. Try one and you’ll soon see why JCB is the backhoe market leader in 78 countries, making just under half of all backhoe loaders sold in the world today. 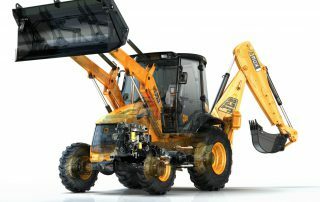 The JCB 3CX is a great value backhoe loader offering superb return on investment as well as finance and service parts. Unlike most entry level machines, it’s extremely productive too, with superb earth moving abilities. The 3CX has a top speed of 23mph so you can reduce travel times on site and between locations. A large 38 gallon fuel tank extends refuelling intervals and maximises productivity. We use a powder coat paint process on all JCB 3CX backhoes which provides a high quality finish. Paint coverage is optimised and your machine stays looking good for longer. Thicker steel is used to construct the excavator on the 3CX and larger stress relieving plates eliminate the chance of failure and reduces cost of ownership. 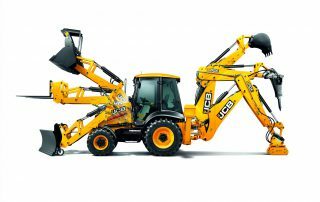 The 3CX backhoe loaders cab, axles, transmission and engine are all designed and built by JCB. All components therefore work in perfect harmony for optimum reliability. Our hydraulic cylinders have friction welded ends to give extra strength. Rear stabilisers are equipped with twin directional hose burst check valves (HBCVs), which means the legs can’t move during machine operation and cannot fall when roading if a hose were to fail. 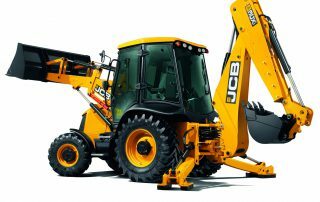 To protect boom and dipper hoses on your JCB backhoe during trenchwork, they’re enclosed inside the rear structures of the machine. Kingpost hoses are enclosed in a flexible, robust guide to keep them from snagging or sustaining damage. To protect the stabilizer rams, as standard, the 3CX is fitted with guards to protect the rams and avoid costly repairs plus added downtime. To guarantee ultimate performance in all conditions, the 3CX backhoe is equipped with 4WD as standard and a limited slip differential to ensure traction in the toughest conditions. 2WD can always be selected to reduce tire wear while roading. 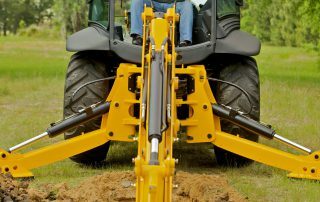 This backhoe excels in both uneven terrain and confined spaces thanks to a winning combination of high ground clearance and an excellent turning circle. 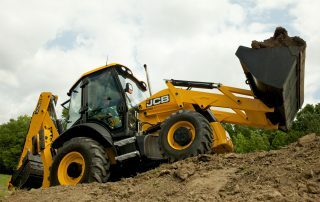 The JCB is the only machine in its class to offer true self levelling on raise and lower of the loader arms as standard. This provides fast and accurate movement of palletised loads and maximises loads when using a bucket. Loader float as standard allows the operator too quickly and easily grade with the front bucket. Leaving sites flat and level every time. With up to 40% greater breakout forces than their closest competitor it ensures JCB is the most productive low cost machine available. 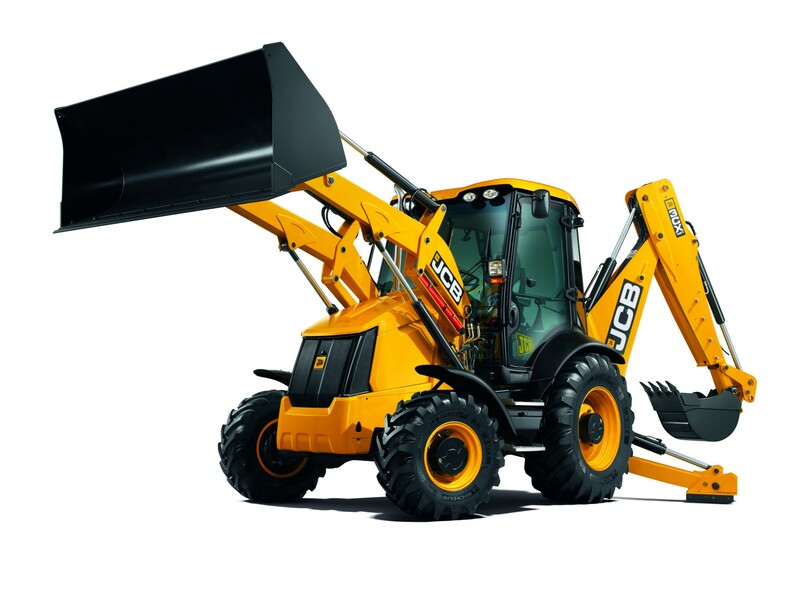 The bonnet on this JCB backhoe loader is a one-piece unit, and opens easily without having to remove extra panels. 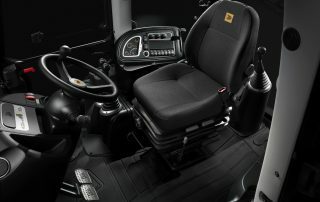 Battery access is excellent, positioned at the front of the machine behind a locked grille to give quick, easy access. We’ve fitted additional fuel filtration on this backhoe loader to reduce dirt in fluids and prevent blockages. There’s storage aplenty on this backhoe loader, with work tools easy to accommodate even if you choose the canopy option.